I’m writing this as we drive back to Seattle after having attended the closing ceremonies to the 2010 Winter Olympics in Vancouver/Whistler. It’s been a melancholy last day and a half, saying goodbye to new friends and knowing that this wonderful gathering couldn’t last forever. Still, I can’t imagine a better ending for Canada, or for anyone who attended the games. Not only did Canada break the curse of not having won a gold medal on home soil, it hit a new record for gold medals for a host country with 11 gold medals… and then went on to win three more! And the best part was the 14th gold medal, the one Canada cared about the most. Today Canada won gold in the final hockey match against the United States. Vancouver burst into celebration just as we pulled into town. I rolled down the windows of our rented red minivan and high-fived several passers by. As we walked through town the good feelings were palpable. I’ve been thinking about it for the last two weeks, and I haven’t really figured out why I’ve been rooting so much for Canada. Perhaps it’s because I remember backpacking through Europe in the late 80s, and you could always tell the Canadiana by the maple leaf on their hat or backpack. They had to let you know they were not American. That made me aware early on of how difficult it must be to live in the shadow of such a powerful neighbor (and how frustrating it must be to lose in sports to that neighbor!). I thought maybe I was supporting Canada simply because Whistler is so dear to our hearts. We did get married there, after all. If it’s happening in Whistler, it’s happening in our second home. Or perhaps I was supporting Canada because they have done such a tremendous job of hosting the Olympics that the country deserves the gold medals to go along with it. over Canada and elsewhere – many flying and even being housed on their own dime – were nothing short of heroes. From those who hit the mountain at 3:30am every morning for 2 weeks straight to prepare the courses for alpine skiing to those who sat for hours in the rain with loudspeakers and cheerily told spectators where to find the bus, they were unfailingly competent, committed and polite. I have heard again and again from people who have worked at other Olympics that the 2010 Winter Games were spectacularly organized and that the volunteers were a critical piece of the success. Definitely. But back to why I was pulling for Canada: I thought maybe it had to do with Canada’s infectious enthusiasm. As the Olympics wore on, more and more people were wearing red hockey jerseys, red toques, red scarves and red mittens. I also figured maybe I was rooting for Canada because they were such fabulous spectators, always cheering on the last skier down the mountain or reserving their loudest applause for the athlete who crashed but then got back up again to complete the race. But then, all the Olympics fans were amazing both at the sporting events and everywhere else they went. Several performers in Whistler told me they had never before felt so much love emanating from an audience. Then I decided it just didn’t matter why I was rooting for Canada. I just was and now I feel very happy for them. They gave the world a wonderful gift with these Winter Olympics and, in a way, the medals they earned feel like they belong to everyone who was a part of the Olympics. Or, as Michael J. Fox put it to us at the Closing Ceremony, when you come to Canada, you’re Canadian. Two days ago we visited the Olympic Village, the secretive place south of Whistler that houses hundreds of athletes from 81 countries, in addition to their coaches, physical therapists, officials and anyone else the athletes need with them to accomplish what they’ve come here to do. The athletes village is the most difficult place to get into in Whistler, which adds to its aura of mystery and the many rumors surrounding it. One story, confirmed by multiple sources, was that, in addition to a restaurant serving foods from around the world, a state of the art gymnasium, and musical entertainment, athletes were also provided with 100,000 condoms. Moreover, a week after the games began, officials from the Canadian Health department were seen delivering fresh boxes of condoms. The athlete’s village is a lot more peaceful than one might expect. You hear about condom deliveries and you imagine utter debauchery. But then you remember that athletes are here first and foremost to compete at the highest levels in their disciplines in the world. And you realize that most athletes probably only let loose once they win a medal, like the Canadian ladies bobsled team which won gold in Whistler on Thursday and was seen partying late into the evening at the GLC and then at the Longhorn, dancing onstage with The Roots. But back to the Athlete’s Village. When you’re here it’s clear some serious work actually goes on. Everywhere you look, athletes are jogging side by side: a Slovenian and his coach here, three young Swedish women there, a very sweaty Brit across the street. Everyone is wearing athletic gear, with country colors and names proudly emblazoned on them, all the time. No one wears street clothes. A shuttle bus with a friendly driver circles the athletes village, taking only a few minutes to complete the loop. Should you choose to ride the bus, be sure to have country pins on hand, because the trades on the bus are ongoing and nearly obligatory. The athlete’s village is both smaller and more spread out than we expected. It looks like a ski town somewhere in Europe, complete with a stream running through it. The bus travels first along the main path with the largest permanent structures to the left side. These are the attractive three-story wood and glass buildings that house the gym, entertainment lounge and so forth. In between them is an open grassy area with decorative touches designed to evoke the spirit and look of these Winter Games, including an obelisk that’s lit up at night in the Olympics theme colors of green, blue and pale purple, an ethereal green wire sculpture, and antique medal gondola car. On the right are white tents with temporary facilities like the medical center and the massive dining hall, which I’ll describe later. After passing the main common areas, the bus loops left and uphill towards the housing and offices for each NOC (National Olympic Committee). These are located within charming, narrow three-story units in pleasant earthy colors that look straight out of a suburb in Scandinavia. These quaint condos serve as offices and housing for the athletes, while many coaches and support staff stay in trailers that will be removed when the games end. Once the games are over, walls within the condos themselves will be rearranged, and appliances installed in now unfurnished kitchen areas, transforming the condos into employee housing. It’s not hard to tell which countries are located where. Every unit is clearly identified with a huge flag from the home country hung from the second story window, making for a wonderful display in the serene little village. We were able to visit the Athletes Village because each delegation has rights to a few guest passes per day, most of which it uses for athlete’s families. Since the Olympics are nearing a close, Jorma was able to use them for us. It was a good day to visit the Finnish delegation, as the women’s hockey team had beat their longtime rivals, the Swedes, to earn a bronze in that event. And the Finnish women had also won a hard-fought bronze in the cross-country relay. 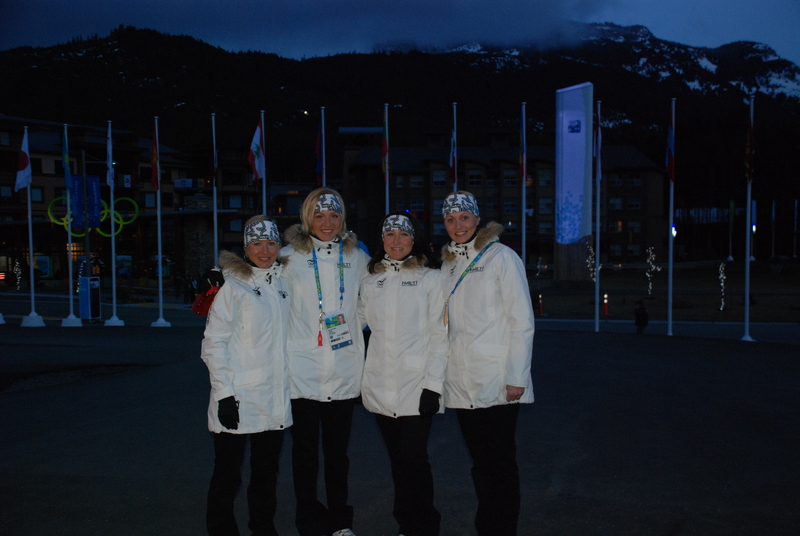 Above is a photo of the Finnish cross-country relay team on their way to the medals ceremony in Whistler’s Medal Plaza. After we photographed the Finnish bronze medallists, we went for dinner in the dining hall. The hall’s massive size is a reminder of just how big an event the Olympics are. In it’s first three days the dining hall served 50,000 meals. We were able to choose Asian food, Italian food, Continental food, and plenty of things in between. There was a pasta bar, a salad bar, a grill, and we could opt for as many servings of anything we wanted as many times as we wanted. Because it’s a sponsor, there’s also a full service McDonalds within the food hall. Volunteers told us that as soon as athletes are done competing, they go for the McDonalds. Well, at least they wait until they’ve done their hard work before putting that stuff into their bodies. Although she’s not staying there, Lindsey Vonn sat at the table behind ours in the dining hall. Everywhere we looked we saw young athletes in brightly colored workout gear — the green of Australia’s sports teams, the bright blue and yellow of Sweden or Croatia, the unmistakable red and white checks of Croatia — sitting together. Of course, the athletes all appeared young, fit, healthy. And good looking. No wonder there was a box of free condoms in the ladies washroom. At the start of the Olympics Canada fretted whether it could break the curse of having hosted two Winter Olympics already but never won a gold on home soil. Tonight Canada earned it’s tenth gold medal! That’s more than any other country at these Winter Games. It’s Friday night and Whistler was celebrating. The town was alive with cheer and the audience at the Fire and Ice show and at the GLC was emitting love. After the mess with our tickets today and the embarrassment of Finland’s first 12 minutes against the US in hockey today, it was great to soak up the happy vibe. What a day. Woke up feeling very bad about missing my shift at alpine skiing today. I would miss the Ladies’ Slalom race and wouldn’t be able to work on a story I wanted to write. No matter, I thought. The reason I’d be missing skiing was that Mika had somehow managed to get tickets to the Finland-US Men’s Semifinal Hockey game in Vancouver. I hadn’t yet been to a hockey game at these Winter Games, and Mika said the atmosphere at the games was fantastic and well worth what we’d paid for the tickets. So we woke up early, bundled the kids up in waterproof gear and dropped them off with the babysitter to see the Ladies’ Alpine event under very wet Whistler snowfall. We set off with Mika’s dad and former Finnish hockey star Jorma Salmi to see the game. We were rushing by the time we got into Vancouver. We parked the car, ran to the Seabus ferry, and made it onto the boat with 17 seconds left. We got off the Seabus, walked quickly to the Skytrain, and again got lucky with a train that was about to leave the station. Whew. Because Mika had to buy the tickets in sets of two, we had one extra, which Jorma agreed to sell. We split off from him and hurried in the rain towards the stadium entrance. We waited impatiently in security as a man in the line ahead of us bantered with the personnel and took eternity to empty his pockets. How many pockets can a person have? Finally we were through security and at the doors to the stadium. Mika handed the volunteer his ticket. She scanned it. A red light appeared. I handed them my ticket. Rejected. I dropped my Finnish flag on the ground in disbelief. Apparently we’d been sold duplicate tickets. Someone was already in our seats. Think fast. Is there a box office? Yes, we were told, but they doubted we’d be able to get tickets. We found Jorma walking towards the stadium and told him the bad news. He’d been walking with the guy to whom he’d sold the other ticket. Well, maybe their tickets, since they were part of a different set, would work. They went off to try. I asked anyway. Yes, they actually had tickets to the game. Huh? I could have asked why the heck the signs said otherwise, but I was too relieved to care. The day was saved – wasn’t it? We called Jorma a dozen times before he answered to say he couldn’t get in either and had returned the cash to the man he’d just sold the fourth ticket to; that guy then went to see the game at a bar. So we bought three tickets from the box office with the big signs saying they were sold out. This time security took more than an eternity but we were happy to at least be going to the game. The two guys behind us, Canadian hockey fans who like all the other Canadian fans there would be rooting for Finland, talked about how great the Finnish goalie Kipprusoff was. “Normally he hate him, but today we love him,” they said. Kipprusoff would hold off the Americans, they believed, as he had so many other teams so far. We got through with 8 minutes to go and sprinted all the way to the stadium. We found Jorma by the door, handed him his now legitimate ticket and ran up to our seats. Hooray! We made it with a minute to go. Then two minutes into the game the famed Finnish goalkeeper stepped way out ahead of the goal and accidentally passed a puck back at a US player, who scored. Then the goalie crumbled. Not used to making such mistakes, he couldn’t take it. Within minutes, he let in three more goals. We were seated directly behind the goalie in the eighth row; it felt as if the pucks were hitting us straight in the gut. I felt ill. The Finns replaced the goalie but were so shell-shocked that the next goalie let in two more goals. Do we leave now? I asked myself. Fortunately, the Finns regained their composure after the first horrible 11 minutes and the first 20-minute period ended with no more goals. The next two periods, with the new Finnish goalie, remained goal-less and, amazingly, the Finns kept the puck down by the American goal nearly the whole time. But this was not enough to save face. Indeed, we’d put away our Finnish flags. Mika’s big flag was off his shoulders and folded into his pocket. One goal by the Finns was needed. Just one. With a handful of minutes left, the Finns scored. The stadium erupted. Whew again. It’s no surprise that the Olympics are a sensory overload. Any time you bring together over 5500 athletes and officials from over 80 countries, together with 10,000 media members, 25,000 volunteers and hundreds of thousands of fans, “loud” is going to be understatement. Add to that 86 sporting events – each viewed by thousands to tens of thousands of fans, broadcast on massive video screens at the events themselves and in public areas throughout Whistler and Vancouver, and accompanied by loud music and even louder fans – as well as hundreds of performance acts and free music concerts every evening. Cacophony. Yet when I look back on the Olympics, the sound that I will most remember is the silence. It was the silence riding up the lonely chairlift on dark, chilly mornings on my way to the Whistler Creekside press center, hours before the world’s top skiers were set to race. The silence would only end when I entered the center and heard the murmur of reporters and photographers from around the world settling in, saying hello and discussing the upcoming competition. It was the hushed wind at Cypress Mountain as a snowstorm descended the day we went to ski Ladies’ Ski Cross – which were won by Whistler native Ashleigh McIver, who said the harsh conditions were like skiing at home. Because we’d chosen to skip the morning qualifiers and thus the mad rush, we were able to walk the 1km from the bus to the entrance in peace, taking in the view and watching the Olympic flags rustle in the breeze. They sounded like water flowing under glass. It was the remarkable calm at the Alpine Skiing press center after the competition was over, the medals earned, and the post-event press conference completed. It was an astounding thing to see 400 journalists seated side by side in utter concentration, typing away on laptops to file stories for newspapers 3, 9, and 10 time zones away. But the silence that was most striking was the day I went with my family to see the two-man bobsled at the Whistler Sliding Center. It didn’t start out quiet. The Canadian team was ahead after the first run and the crowd was roaring. As the two man team prepared for their next run in their shiny red bobsled, people clapped, yelled, whistled, rang cowbells and blew horns. As the sledders ran and jumped into the bobsled, and began swooshing down the track, they gathered ever more speed. At the first time check, they were ahead of the next team. At the second one, they were even farther ahead. The crowd was going wild. Suddenly, just before the 180 degree arc at the fastest part of the track, where the crowd numbers are at their largest, the team misjudged a turn and the bobsled overturned. In an instant, all noise — cowbells, horns, clapping – stopped. We watched in shocked silence as the deep red sled whizzed by, upside down, in front of us, from left to right. It was as if the audience was afraid to breath. It’s amazing how loud your thoughts can be when everything falls so suddenly silent around you. I remembered the fan who told us we’d just missed seeing the New Zealand bobsled that had tipped on its side, requiring course workers to clean blood off the track. I remembered the tragic lugist from Georgia. I wondered, as we watched the upside-down bobsled race to the finish line and course assistants rush to the scene, what had happened. What were we witnessing? What gore were my children about to see? The bobsled was turned upright and a silent eternity passed. Then one of the Canadian bobsledders stood up. The crowd cheered in nervous silence. Then the second bobsledder stood up. The cheers were deafening… and welcome. Have you heard about the Olympic pin thing? The deal is you show up with a bunch of pins from your home country, or town, or ski club, and you trade them for other pins. I was sure it had to be some relic from the past. I mean, what’s the point in collecting pins from other countries nowadays when it’s so easy just to travel to those places, unlike 50 years ago? Why collect buttons on your lapel when you can collect email addresses in your contact list? Who needs to connect with pins when you can connect with Facebook? Clearly, I didn’t get it. The Olympics are here and now. Spectators and even former Olympians don’t travel to the Olympics just to watch the competitions. They attend the Olympics to be in the middle of them. In the middle of the spectacle. In the middle of the drama. And in the middle of all the people. When you are here, you want to take it all in. You want to chase down the tall men with the black, blue and white flags to ask where they are from. (Estonia). You want to tell the lady standing next to you that you just met a guy from the US snowboarding team. You want to listen when an elderly Brazilian woman recounts how she competed in the Helsinki Olympics in 1952. The pins serve as a way to open the conversation or to seal the deal. My daughters hats’ are covered in pins. They have met all sorts of individuals who stop them and politely ask if they want to trade pins. I can’t imagine a more exciting way for two young girls to feel like they are a part of the action. Once we start talking to the pin traders, we learn that they have a sister-in-law competing in the two-man luge, or that they are from the Netherlands and are attending their third Olympics. Yesterday evening a gentleman at the Irish Pub couldn’t contain himself. He had to tell someone that he’d met the parents of gold medal skier Aksel Lund Svindal on the chairlift that day and had spent the entire afternoon skiing with them. He was talking to the right crowd. Our own son, called Aksel, was with us. Maybe because of the name thing, we’re the Norwegian skier’s biggest fans. We chatted with the man at the pub for a while and then concluded our conversation with an exchange of pins. At the two-man bobsled last night we were discussing the speed of the bobsledders with a Vancouver native standing next to us. Then he spontaneously gave us a cute pair of red, knitted Canada Olympics mittens for Aksel. (OK, not pins, but in fact more practical). We thanked him with a gift of two Finland pins. He was delighted. The Olympics are about the athletes and everyone else as well, from the support staff to the volunteers to the fans. And the pins are a way to meet all of those people, to thank them for being a part of it, and to remember the experience long after the games are over. “It’s like being at Burning Man without a costume,” said my friend Maryam over dinner the other night. She’d arrived in Whistler the day before and was already feeling like her normal winter clothes weren’t going to cut it here. After dinner she rushed out to one of the many shops open late into the evening and bought some Olympic t-shirts and US and Canadian flags. It wasn’t much, but it was a start. Her husband, born in Montreal, took it a step further. The next day he hit the slopes with a snowboard and a Canadian hockey jersey. It turns out he was one of two dozen skiers and boarders wearing the same thing. No matter. He’s worn a hockey jersey every day since. It took our kids even less time to figure out that the Olympics are special. After attending their first sporting event (ski jumping qualifiers) the morning before the Olympics officially began, they immediately wanted an attire upgrade. Since then our girls haven’t left the house without Finnish flags draped over their shoulders like capes and ski caps festooned with Olympic pins. For days on the mountain, their ski poles carry a pair of Finnish flags. There are many ways to enjoy the Olympics. You could buy a lot of tickets and just watch the sporting events. But a better way to go is to jump right in. Whistler is alive with multiple TV screens, performance stages, music, colors, and people. It’s a two-week party and everyone is invited. So put on your party clothes and get to know the guests. At any time of day or night, the pedestrian-only streets of Whistler are jammed with fans, athletes, volunteers and former Olympians wearing the country’s colors and carrying flags on poles, over the shoulders, wrapped around their heads or, in the case of particularly large flags, in groups of six or more racing through the town. Interesting flags or unusual national outfits are a great way to start up a conversation with those around. or you can just overhear two people commenting on the difficulty of the Ladies’ Downhill course and then chime in with your own opinion. You can strike up a conversation with another avid fan, a serial Olympics spectators (amazing how many people go from Olympics to Olympics) or a current competitor. Everyone’s senses are alive and their hearts are open. And the party is for all ages. My father-in-law, an Olympian who competed in Squaw Valley exactly 50 years ago and who’s now volunteering with the Finnish delegation, is having the time of his life. Our not-quite three-year-old son is thrilled with the Olympic mascots, Quatchi, Sumi, Mukmuk and Miga, life-sized version of which visit all the events. Folks in between can dance up a storm to DJ’s like Dead Mouse or take in the nightly “Fire and Ice” snowboard and ski-jumping spectacle. There’s so much to take in that two weeks doesn’t even seem like enough to enjoy it all. Hmmm…. maybe that’s why so many folks go from Olympics to Olympics. Who wants an awesome party to end? Yesterday we went to see the Men’s Luge event, featuring the final two of four runs, to determine who will bring home the gold in a sport that just two days cast a long, dark shadow over the Winter Olympics Opening Ceremony. If you weren’t paying attention, you could have forgotten than only 50 hours before a young man was flung to his death in a grizzly accident. The sun was out, cool jazzy music was playing, and the announcer was upbeat. Walking throughout the woodsy area up the length of the track all the way to the top, we spotted avid fans draped in Indian flags, kids munching on cookies as parents sipped cups of beer, and looked out in the view of the snowy mountain across the valley. The luge event is remarkably accessible. In many places you can reach out and touch the track. You can choose whether to check out the lugists at the top where they’re just gathering speed, through the wide turn at the bottom when they’re at their fastest, or in the very very long uphill runout where they gradually slow down. You are so close you could see their faces, if they weren’t going so quickly. It’s a game to guess what colors they were wearing. Groups of people cheer on their friends when they actually manage to snap a picture of the blur whizzing by. But in fact the lugists yesterday were not hitting the speeds that they had in training just last week. Everything may have looked “normal” to the onlookers, but behind the scenes a lot has changed. Lugists report that the normal pre-race excitement was subdued. At least one volunteer in the press office was too shaken up to return to work. The most obvious change was in the area where Nodar Kumaritashvili was flung off his sled. A wall has been built behind that area. Further along, the potentially lethal steel beams have been covered with bright orange padding. Medical personnel throng the area, with ambulances only steps away. Critically, the speed that is so striking to us spectators is actually at least 15km/hour slower than it had been a few days earlier. A safety crew member told me it’s a visible difference. A few of those on the inside say the safety measures put in place to Kumaritashvili’s were excessive, changing the track from the fastest in the world to one which is simply too slow. But both circumstances and expedience came into play. The Men’s Luge start was moved to the ladies luge start at Turn Three, while the Ladies Luge start was moved to the junior start at Turn Six. It would have been practically impossible to build a new start at, say, turn One and a Half. A lot of technology goes into that special start-line and in fact they were still completing the new Ladies start zone one day before the competition. A technician was measuring the wooden steps and a cameraman I spoke to said they would have to work into the evening to figure out how to set up the best camera angle in its new location. The sunshine that was so pleasant for us spectators was also threatening to slow down the event further. Armies of volunteers pulled down awnings in between runs until at one point in the afternoon they had to keep large portions of the track shaded off from onlookers. Finally, at around 4pm, when the sun went behind the hill all the awnings were opened, the entire track was sprayed down by two more intrepid volunteers walking the length of it with crampons on their boots, and the final fifteen were off!